This blog is primarily a vehicle for self expression, but many people have told me they get value from it and it does cost time and money to run. If you’re so moved, I’ll keep this page updated with ways you can contribute. These poor headphones have had it. 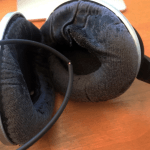 Most urgently, I’ve been wanting to replace these sad headphones for about a year now, but things have been a little rough in the past year. You can support me with an Amazon gift card donation to hello [at] kronda [dot] com to replace these sad headphones with updated wireless version that will be safe from the cat. Update October 2, 2016: I’m only $116.00 from my headphone goal! Always fits. Never goes out of style.